Our revolutionary jumbo extra large earring backs in 14k gold, 18k gold or platinum put an end to those dreaded droopy or floppy earrings. These monster jumbo large tension earrings backs not only add support to your earrings, they are extremely secure and safe. 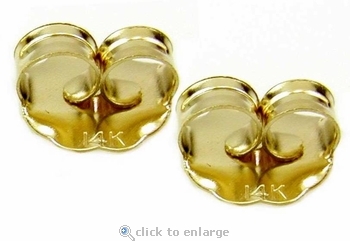 We recommend our extra large earring backs in solid 14k gold, 18k gold or platinum over traditional threaded screw backs and screw posts. Screw backs tend to get their threads stripped over time due to the fact that gold is a soft metal and eventually you would need to have them replaced. 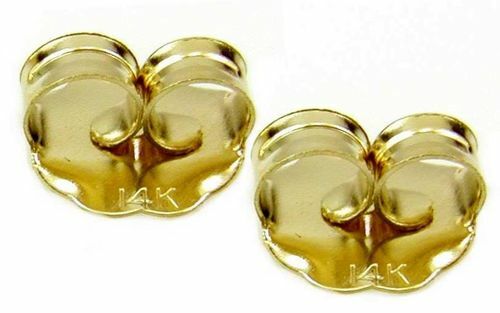 With our jumbo large earring backs you would not have any issues because they are exactly like normal tension earring backs but they are larger, stronger, more secure and provide amazing support for your ears and your earrings. Our jumbo earring backs stay secure and do the job of keeping your earrings in an upright position on your earlobe. Great for all your pierced earrings, especially stud earrings. These monster jumbo large earrings backs measure just under 10mm, 3/8 inch in diameter, making them more than double the size of traditional earring backs. Available in 14K yellow gold, 14k white gold, 18k yellow gold, 18k white gold and luxurious Platinum.